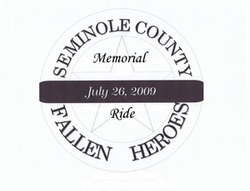 2012 marks the 4th year of the Seminole County Fallen Heroes Memorial Ride. Thanks to the generosity of sponsors, riders, donors, volunteers and citizens, the proceeds the previous rides were used to build the Seminole County Memorial Park at the Seminole County Law Enforcement Center at the corner of 1st and Brown in Wewoka, Oklahoma. The 2012 Memorial Ride will begin and end at the Memorial Park. 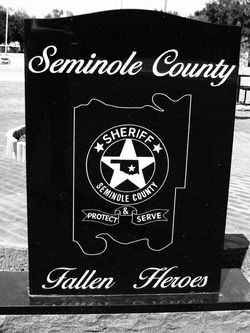 The 2012 Seminole County Fallen Heroes Memorial Ride with be held on September 8, 2012. Registration forms may be picked up at the Seminole County Sheriff's Office or you may download a copy HERE. Pre-register by August 24, 2012. The first 200 to pre-register with receive a free T-shirt. The Poker Run will begin and end at the Memorial Park. Registration on the day of the event is from 9 - 11 am. First bike out at 10 am and the Last bike out at 11 am. Last bike in at 3 pm. Best hand $1000.00, worst hand $500.00. Poker Run hands are $15 per driver and $10 per additional hand. All motorcycles and automobiles are welcome to join the Poker Run! There will also be 50/50 tickets and an auction. For more information, please contact Becky at 405-220-3475 or Brenda at 405-221-0479. Please join us in Wewoka, Oklahoma, for the Poker Run and fun! Everyone is welcome!